Aren’t You Just a Biologist? Mixing samples for my experiment. It’s true that I’ve spent 90% of my graduate school career using biochemical techniques to prepare my biological samples (more on these later) but, like other physicists, I am ultimately trying to measure physical quantities: energies, forces, and motion of matter. I am a physics graduate student at The Ohio State University with an undergraduate degree in physics (from Miami University in Oxford, Ohio). I have not taken any biology or chemistry classes since high school. I spent the first few years of graduate school teaching myself all of the biology and chemistry I need for my experiments, and I’m still learning new things today. Mastering completely new lab techniques that most physicists will never do is actually a lot of fun. At Ohio State, I work in Dr. Michael Poirier’s biophysics lab. We study how DNA is organized and compacted by proteins inside the cell nucleus. DNA contains all of the information for how our bodies look and function, and we have nearly 2 meters (about 6 feet) of DNA in each of our cells. Organization and compaction of the DNA is necessary for all of it to fit inside our tiny cells, so our cells wrap the DNA around protein molecules called histones into what look like little spools of thread. These DNA/protein spools are called nucleosomes. An image of a small section of DNA wrapped into nucleosomes taken using an atomic force microscope by a former graduate student in our lab, Marek Simon. This type of microscope allows us to see things that are too small to see under a regular light microscope. By wrapping the DNA into nucleosomes, the DNA becomes more compact and is protected from damage. My samples usually consist of a single nucleosome, so that I can observe the physical interaction between the DNA and the proteins. 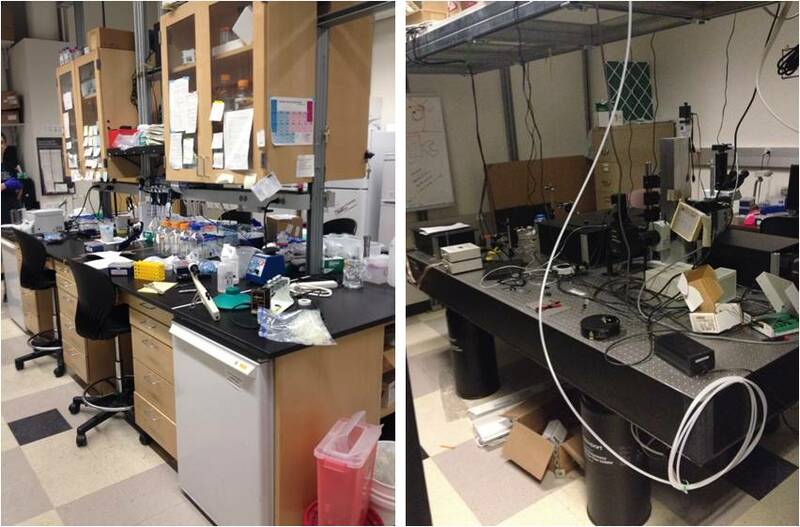 Our lab is broken up into two physical areas: the biochemistry lab and the physics lab. I spend most of my days in the biochemistry lab making my DNA/protein samples. Thankfully, I have helpers, millions of them actually. 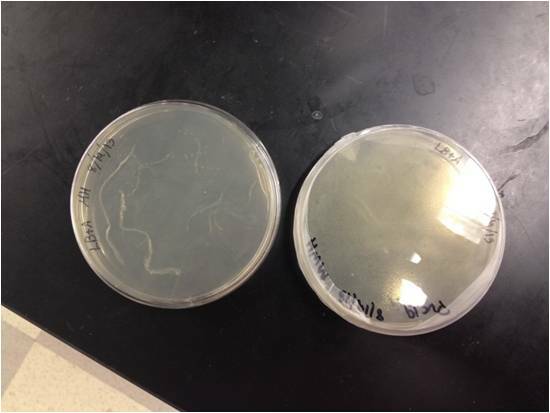 We program E. Coli bacteria to make our DNA and proteins, so part of my job involves carefully growing E. Coli bacteria. Sometimes this means that I have to come into the lab in the middle of the night to check on them. I can’t be sure, but I think singing to them helps. The biochemistry lab (left) and the physics lab (right). E. Coli bacteria are typically associated with food poisoning from contaminated meat, but they are also found in your intestines and help you digest your food. We use E. Coli because they reproduce very quickly (about once every 20 minutes), and we can easily program them to produce DNA and proteins that are usually found in other organisms like frogs and mice. By using E. Coli, we don’t have to sacrifice frogs and mice for our science. Agar plates growing E. Coli bacteria. These particular ones were used to produce DNA. These plates are about the size of the palm of your hand. The streaks you see are colonies of E. Coli bacteria growing. Each streak contains thousands of individual E. Coli bacteria. So where does the physics come in? Once I have my nucleosome sample, we use a microscope equipped with lasers to look at them. The lasers are used to excite dyes on our samples, so that we can see them and observe dynamics of our DNA-protein structures. I think the coolest part of this experiment is that because the dye molecules are so bright, we can see individual DNA molecules with proteins fluctuating on our slides. The down side is that I end up spending hours in a dark room watching little blinking dots on a screen. That is how research is though. Some days can be pretty boring, but other days, when your experiment is working, you are observing something no one has ever seen before. Microscope slide containing our sample on the stage of our microscope where we do our experiments. 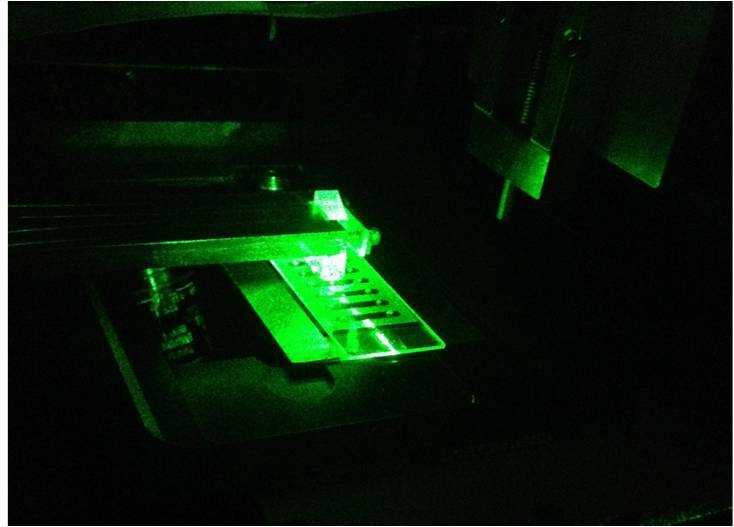 The green light is from a laser that we shine onto our samples to illuminate the dye molecules attached to our bio-molecules. One of the best parts of biophysics is that it is highly interdisciplinary. In my research I work with biochemists, mechanical engineers, chemists, materials scientists and occasionally other physicists. I get to meet graduate students from other departments at Ohio State, but also from other universities and sometimes other countries. Sometimes I work in their labs and sometimes they work in ours. There are some days that our lab is busier than the cafeteria at lunch time. I am a very social person, so I love having someone to talk to while I work. With so many people in the lab, it’s hard not to have a little fun. We have a freezer in our lab that is at -80 degrees Celsius (-112 degrees Fahrenheit) to store protein, DNA and E. Coli cells for long periods of time. 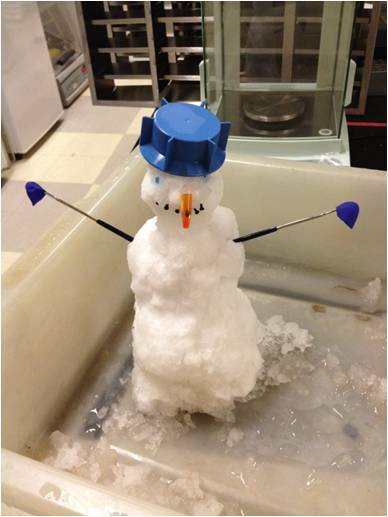 The freezer accumulates a lot of snow and ice, so one day while we were cleaning it, we decided to make a snowman. Scientific research isn’t all fun and games, but it isn’t boring all of the time either. We work pretty hard most days, but being able to observe single molecules is really cool. I am very happy that I decided to become a biophysicist whether it’s ‘real’ physics or not. 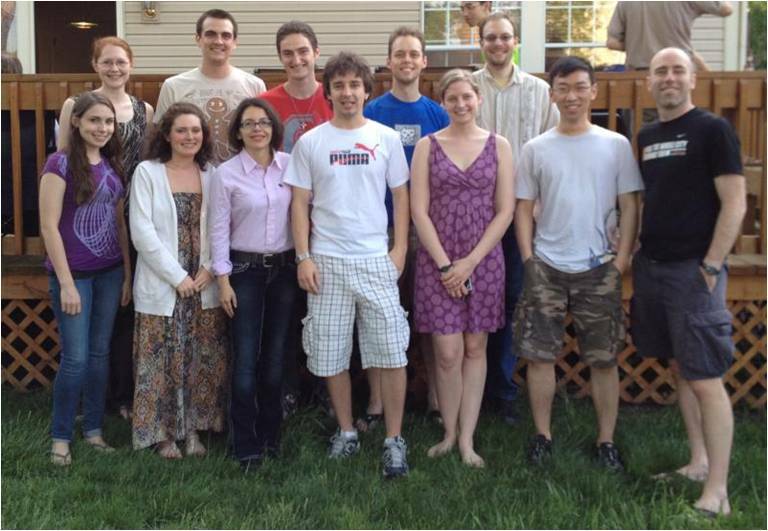 Poirier Lab at our yearly summer picnic. I am in the front row, third person from the right. 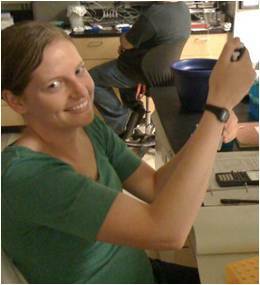 I am a 5th year graduate student doing experimental biophysics at The Ohio State University. 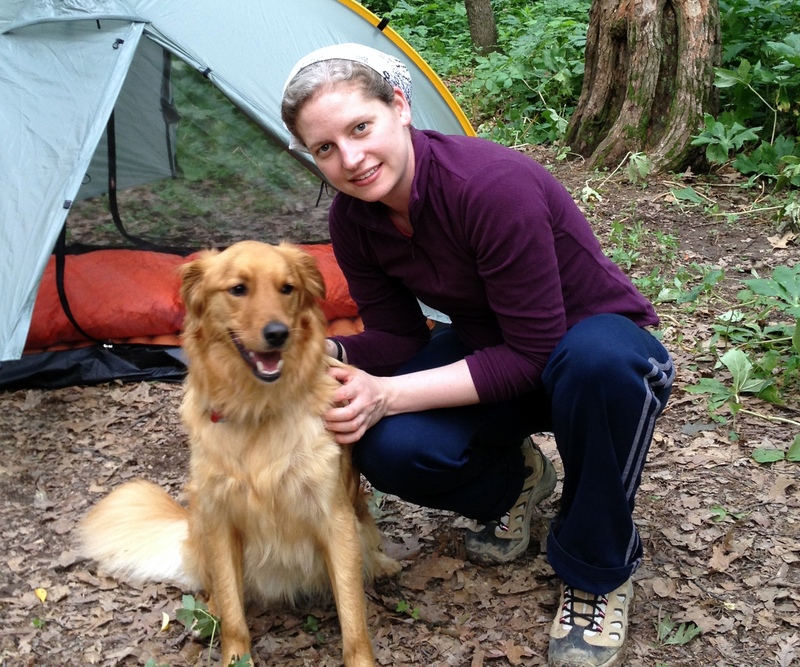 In my spare time, I enjoy running, hiking and camping with my husband, Dan, and our dog, Indiana. Our cat doesn’t really behave that well on a leash. When I graduate, I hope to conduct research in the biotech industry and someday start my own company.